Take a stand against online spying – Laila Yuile on politics & life in B.C. I so distrust Harper. I can’t help but think, it is he who is behind the internet snooping. Harper is so underhanded, sneaky, and a behind your back personality. Snooping the internet, is exactly what someone like him would do. Harper and his ranting, raving minister remind me of someone else. Internet snooping to me is, just another method to control. Control is what Harper is all about. Democracy, Civil Rights and Liberties, are vanishing in Canada. Even other country’s media see that, and have written about it. The U.N. refused Harper a seat. The New Trans Pacific Trade Group, don’t want Harper either. Harper is trying very hard to get in. At every meeting of Nations, Harper is the trouble maker every time. He bullies and has hissy fits when he doesn’t get his own way. Harper always manages, to insult and anger every country attending. 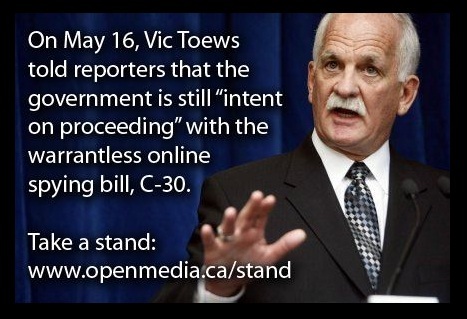 I can’t shake the feeling, Harper is behind this atrocity of snooping the internet. Of course he is Gloria, he and those who direct him…. And then you have him and Christy and entourages going over to China to make deals. And to trust the chinese? Well we all know what happens to their citizens. And then I think there’s also posts about the the Chinese infiltrating governments, and we were warned about that back a bit also in the CSIS report. And yet our governments are allowing them to buy up Canadian resources? Yes, Harper and Co, which includes Christy and the liebs(Cons), it is all about control; power and control. To read about traffic on the internet to blogs by government officials certainly let’s you know that theyr’e “snooping” already. We must continue to blog and post. Media in this country won’t rock the boat as they’re all bought and paid for. I just would hope that even “one” would say enough is enough. Anyway keep up the great work Laila. You’re the best. And keep it up Grant, Norm, Ian, Rafe and the list goes one. We should never be silenced. Interesting report in the BBC…As I was reading what they are doing to continue to shut down free speech in China… I thought of…Bill 37 ; presently in the Leg.Assembly in Victoria (there may not even be time to debate before it is passed) prohibits sharing of scientific results about diseases in fish-farmed and wild and also mad cow disease etc. Alexandra Morton says in her blog that she could face up to 2 years in prison for sharing this, her results publicly; because of this bill for talking about many results in various labs that she is presently monitoring re: possible diseased fish. What kind of government does that to it’s people??? Thank you for your previous email outlining your desire for better protection for consumers in the growing digital economy. New Democrats recognize the importance of the digital economy and we are working hard to protect Canadian consumers. First, please know that we share the concerns of many Canadians who oppose legislation relating to lawful access, ACTA, and digital locks. NDP Digital Issues critic Charmaine Borg and NDP Public Safety critic Jasbir Sandhu are taking the lead on these issues. – force TSPs to incur the costs of developing this permanent surveillance infrastructure, costs which will likely be passed on to consumers. We recognize that police officers should have the necessary tools to go aggressively after child pornographers and other cyber criminals- so they can be punished to the full extent of the law. However, this can be achieved without making offensive comparisons and treating law-abiding Canadians like criminals. You may also be interested to know that NDP MP Charmaine Borg has been successful at pressing the Standing Committee on Access to Information, Privacy and Ethics, to study measures taken by Google, Facebook and other social media giants to protect the personal information of millions of their Canadian users. Regarding changes to copyright laws, we believe it is important to balance the rights of artists, consumers and rights-holders. Canada needs effective legislation to ensure artists’ royalties are protected; long-distance education opportunities aren’t hindered; and that young people aren’t subject to unfair, expensive fines. Finally, New Democrats have long been on record with our opposition to the Anti-Counterfeiting Trade Agreement (ACTA). We believe that there must be a balance between the rights of creators and users, and that this will not be achieved through a process shrouded in secrecy. Unfortunately, the Conservative government signed this treaty late last year after winning their majority government. For our part, MP Charlie Angus has been speaking out against this treaty over the past several years. We have repeatedly called for a broad and transparent consultation process with the public. This issue demands fair treatment and compensation of copyrighted material along with a fundamental right of access to the Internet. Regrettably, the Conservative government did not heed our advice. You can read more about our opposition to ACTA here: http://tinyurl.com/75xo6rd. Going forward, we will continue to advocate for better protection on behalf of Canadian consumers. Again, I appreciate hearing from you. Please visit our website at http://www.ndp.ca to learn the latest about our team of New Democrats. The most sad of all is, so many citizens are no longer proud to be Canadians anymore. We would have never thought, our country would become a dictatorship regime. I would never have thought, citizens would not want the RCMP as icons for Canada. I would never have thought politicians would call Canadian people names. Pornographers, terrorists, Taliban, and Harper saying the NDP didn’t want to fight the Nazi’s. Harper is the closest thing I have ever seen to a Nazi in Canada. Harper is appointing two new Conservative judges. Ted Moritz is appealing the Supreme Courts ruling, of the Etoboke Center election, being null and void. We will have to see if, one of Harper’s new judges will preside over the appeal. Harper is trying to prevent all the other election disputes. He is also trying to quash, the election fraud, robo-call cheat investigations. What does that tell Canadians? However, spying on the citizens using the internet, is exactly what dictators would do. Dictators are all control freaks, and Harper is one of the worst. Harper isn’t called spiteful Stevie for nothing. Gordon Campbell was just as bad as Harper. Anyone opposing Campbell, lost their jobs. Both Harper and Campbell are so full of, hate, spite, malice, and so vindictive, their sanity is in question. I guess that’s why they worked so well together….they are both right off the wall. If Harper doesn’t like his dirty deeds, being exposed on the internet…perhaps, he should clean up his act. I totally agree. Harper is handing Canada to China. Campbell gave BC to China too, destroying our lifeblood mill industry and mines to China. Fadden of the CSIS, warned us and he is exactly right. China is making huge inroads into Canada. BC was specifically mentioned by Fadden. Harper has no ethics nor morals, what-so-ever. He would most certainly, have Canadian people on the internet spied upon. As of 1:00 pm, Friday, June 1, 2012, the petition has 136,577 signatures. Not too bad! As of 4:15 pm, Friday, June 1, 2012, the petition has 140,238 signatures. GETTING MORE ALL THE TIME. As of 8:00 pm, Friday, June 8, 2012, the petition has 143,527 signatures. IT IS STILL GETTING MORE SIGNATURES AS TIME GOES BY..